Recently, custom jewelry orders have been dominating my studio time. Quite a few requests for baptism gifts and even confirmation gifts. Some include dates, some include names. others with a meaningful quote, gifts meant to be cherished throughout ones life. I am not sure if it was the Designers Show at DogA or the new Epla website (our Etsy) providing me with new exposure on the norwegian market, but orders are coming in and I am thrilled and working to capacity right now. Working on custom jewelry is something I very much enjoy. It gives me the chance to create something unique, and as many of you know, repetitive production work is not something I do. I was contacted last week by a woman who wanted a special pendant made for her daughter Ebba’s baptism. As a matter of fact, she ordered a matched set, one for herself as well. My graphic design background comes in handy when working on custom concepts, as there are often quite a few draft versions prepared prior to finalizing the design. Some customers come to me with a simple concept, others with images similar to what they would like made, others just a thought. 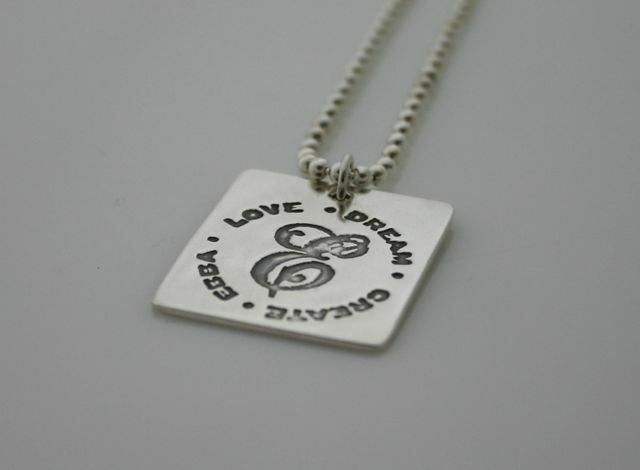 Ebba’s mother chose to include her daughters initial and name, as well as the words LOVE, DREAM and CREATE. What a lovely sentiment for her little girl. I hope she cherishes it. I use Photoshop or Illustrator depending on the project, and print onto acetate (transparencies) I also scan my sketches and print them on acetate. For this example, I was working on a custom ring. To this day, I still have no idea what it is supposed to mean, but I was asked to create a ring that simply said “..it isn’t” – as mentioned in past posts, I get requests for all sorts of things to be put on rings! Once the acetate is ready, I cut out a piece of photopolymer a tad larger than the image and prepare to expose the plate. 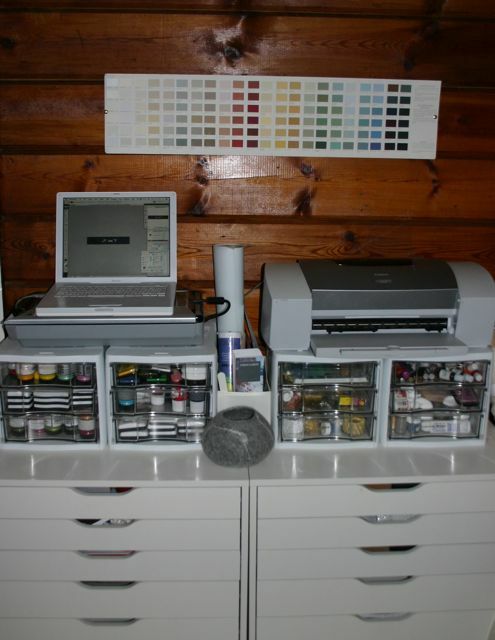 This setup is the one I use for smaller projects (I also use UV for silkscreening, etching and resin work). You can set up an exposure unit in a variety of ways. UV lamps and bulbs are readily available, and once you decide what setup is best for you, you need to establish how much time is required to correctly expose your image. Stouffer guages are ideal for doing this (see below for instructions). When it comes to setting up your studio, something I have learned over the years, is that most equipment out there is readily available from alternate sources. If you go looking for a specialty- small scale UV exposure unit for photopolymer plates, you can go and pay a pretty penny at a specialist shop, or you can do like I did. The unit I am using is actually designed for curing fake nails at salons (yes, they use UV lamps for this) you can find them cheap on ebay (around 20$). 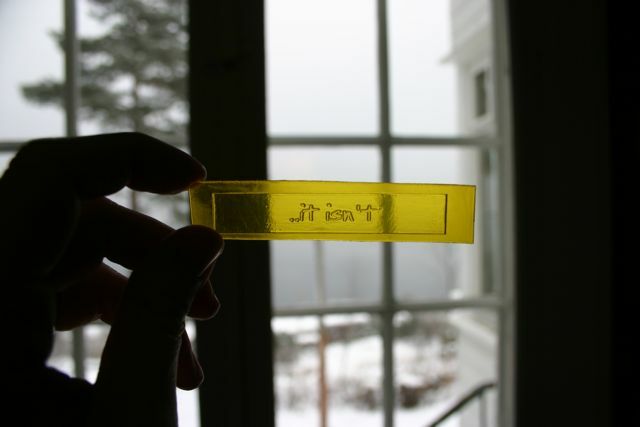 I use a magnetic frame for the glass sandwich, which happens to fit perfectly in the unit. It is an inexpensive but reliable set up and it cost me a fraction of what I would have paid through a jewelry supply store. Photopolymer.. it can be used for so many things.. did you know is often used for letterpress printing.. to create lovely deep inked impressions in gorgeous cotton paper.. ohh.. You just know that if I come across and antique letterpress, it is going to have to come home with me! 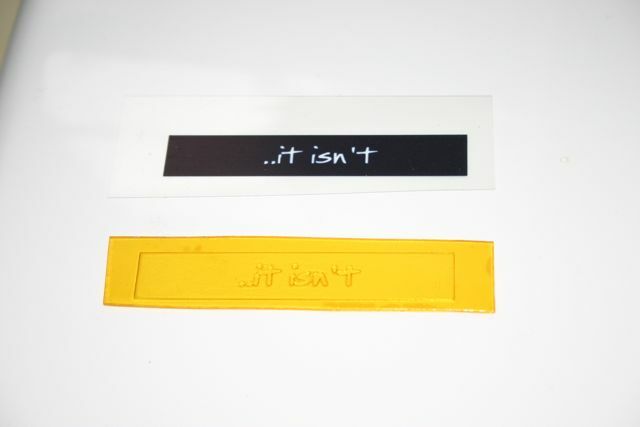 Instructions for using the stouffer gauge to accurately figure out the exposure time for your photopolymer plates): The Stouffer gauge is a reusable piece of continuous-tone film that you should use to test photopolymer plate exposures. Place the Stouffer Gauge in contact with a 1” x 6” strip of plate material (after you peel off the plate’s protective plastic cover). Then expose the plate. You’ll have to guess the first exposure time because that varies depending on the equipment that you use. Start with the exposure time listed on your plate’s tech data sheet. For exposure times, please keep in mind that these times are for commercial photopolymer platemaking equipment. 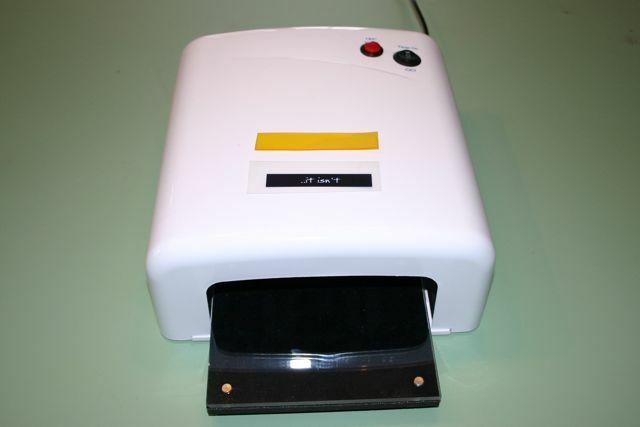 Any alternative photopolymer platemaking devices may have very different times and you’ll have to experiment more to find your ideal time. Also check the plate’s tech data sheet for the Stouffer value you’re trying to hold during exposure. For example, the 94FL has a Stouffer value of 18. Make sure that the exposure used with the Stouffer Gauge hardens the plate for all the numbers up to and including #18. If you goal is #18, and #19 and #20 start to harden during your exposure time, then your exposure time is too long– decrease the exposure time. If your goal is #18, and #17 hardens but #18 washes out on the test plate, then increase the exposure time. You most likely will have to expose several different test plates at several different exposure times to find the perfect exposure. Since the Stouffer gauge is small, you won’t waste much plate material in the process. Hi Shelly, I too am self taught as an artist. I remember looking online for information about how to do this, and there was nothing out there at the time. I wrote this post in 2010 😉 I am a firm believer in sharing information, so I am happy to hear that you enjoyed what you read.